For most of my life, I had a serious dislike for fall. Not because of the season itself, but rather because it meant that winter was right around the corner. As I’ve grown older, I’ve come to enjoy fall a bit more. It’s the season of my wedding anniversary and my husband’s birthday, plus there is something cozy and comforting about it. While I know I’m jumping the seasonal gun a little bit (it is 80+ degrees in Chicago today), I feel as though this bread is another thing that could fall into the “things I like about fall” category. 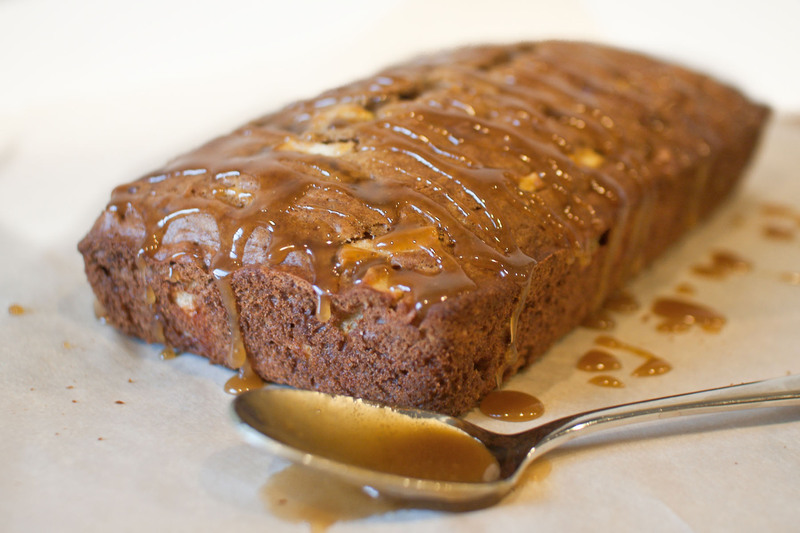 Taking a cue from the ever popular caramel apple, this bread is sweet and delicious. Add in some nuts, cinnamon and nutmeg (what says fall more than nutmeg?) and you’ve got a serious contender for fall favorite. In large bowl, stir together apples, 1/2 cup brown sugar, buttermilk, oil and eggs. Add the remaining bread ingredients and stir until everything is moistened. Transfer batter to a prepared metal loaf pan and bake for approximately 45 minutes or until the top is brown and a tester inserted into the middle comes out clean. Let bread rest for 10 minutes before removing from pans. Once removed, let the bread cool on a cooling rack for at least an hour. Meanwhile, in a small saucepan, melt the butter over medium heat. Stir in 1/4 cup brown sugar and heat until boiling, stirring constantly. Reduce heat to low, add milk, then slowly increase the heat until boiling again. Remove from heat and stir in powdered sugar. Let glaze cool slightly before liberally drizzling over cooled bread (use as much glaze as you’d like — I used about three-fourths of it). I am so ready for the fall, summer has just been way to hot to enjoy. Also, since I love to bake, it is the best season for that. This bread does look tasty and it is surprising that it takes on one apple. Thanks for sharing the recipe for this wonderful fall sweet bread! I’m not one for fall or winter – I am definitely a summer lover but no matter the season, your bread is fabulous. Ah! A fall recipe! 🙂 Actually, apples are already in season – guess I need to start shifting gears in the kitchen! Looks great. I’m a forever summer gal myself. That’s why I left Chicago and moved to San Diego. This bread sounds AMAZE tho! September is going to be apple month in our Seasonal Potluck. I hope you’ll link this one up! Thanks for trying this one out! I had forgotten all about it, but it was sooo good. Thank you!! Yup. I love fall. And like you, I never used to. But, that was because I lived in CA for most of my life and where I was from, fall never seemed to materialize around us — the trees never took on that burnished worn color and there was scarce any pumpkin patches or apple cider mills. But, that all changed when I moved to the Midwest. I fell in love with the smell, the trees, the warm coziness that settles around everything and everyone. 🙂 I can hardly wait for it to arrive this year. Plus, I love my boots and sweaters. I’m fashion whore sometimes. This caramel apple bread looks (and I’m sure smells) delicious! There is nothing better than the smell of freshly baked bread! I LOVE the caramel apple flavor combination, this is genius!!! !